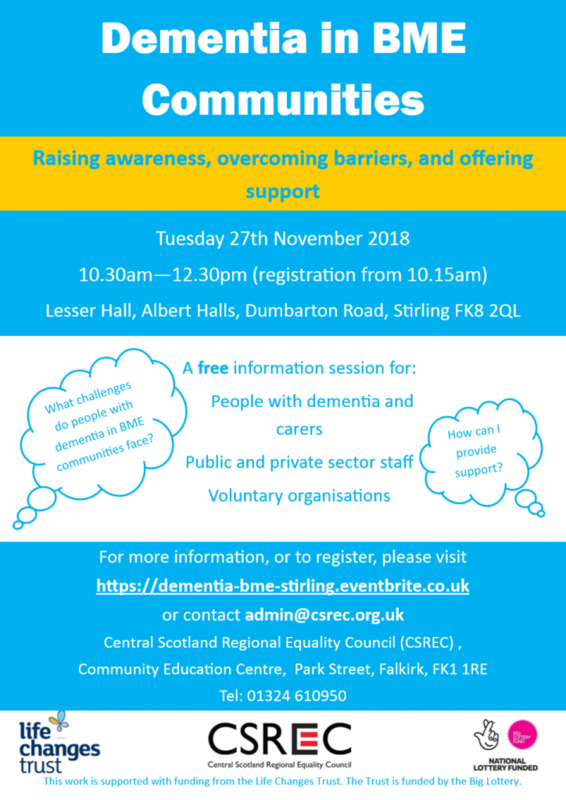 Central Scotland Regional Equality Council (CSREC) would like to invite you to attend our Dementia in BME Communities awareness session at the Lesser Hall, Albert Halls, Stirling, on Tuesday 27th November, from 10.30am – 12.30pm. This session is open to people affected by dementia and their carers, other members of the general public, and public, private, and voluntary sector workers. Led by our Dementia Project Worker, Sarah Noone, this free information session will explore the impact of dementia upon people from BME communities, the barriers that may prevent people from accessing support to live well with dementia, and what we can do to provide more inclusive dementia support services in the Forth Valley. Accessibility: Please note that the venue is wheelchair accessible. If you have any accessibility requirements, please inform us at the time of booking your place. Refreshments: Tea, coffee, and light snacks will be provided. Should you have any allergies or dietary requirements, please inform us at the time of booking your place. Booking: If you would like to register for this event, please visit https://dementia-bme-stirling.eventbrite.co.uk. Alternatively, you can contact us via email at admin@csrec.org.uk, by phone on 01324 610 950, or visit our office at the Community Education Centre, Park Street, Falkirk, FK1 1RE. Please note that places are limited, and booking is therefore essential.